Scheveningen is arguably the best-known seaside resort in the Netherlands and is by far its most popular. Its famous pier, promenade and numerous beachfront cafes ensure that Scheveningen has wide appeal. It draws bathers, foodies who enjoy freshly caught seafood, families for days out and people wishing to undertake activities by the coast. If you want to taste a Dutch delicacy while strolling along the Strandweg — the broad promenade overlooking the Scheveningen’s sandy beach — order a portion of haring (raw herring, served with diced onion) from one of the stalls. The resort is one of the locations across the Netherlands that mark the onset of the new herring season, each June, with celebratory feasts. Known as flag day — Vlaggetjesdag in Dutch — it sees people donning traditional attire while the country’s red, white and blue horizontal tricolour flaps from flagpoles and pokes in miniature from wooden cocktail sticks stuck into succulent slices of herring. Of course, you might prefer an ice cream while wandering the Strandweg and can take your pick from a multitude of stalls. Alternatively, you could always sit down for a drink or to dine in one of the pavilions on the beach. Strandclub Doen (Strandweg 9) is a chic cafe with comfortable terrace seating. The laid-back vibe, fostered by the beat lounge music and white décor, is complemented by a menu featuring elegantly prepared fish dishes and barbecued meats. From there you can race down the beach and enter the sea. During October the average temperature of the North Sea along this part of the Dutch coast remains a relatively balmy 15.6˚C. Bracing by tropical standards, but more than double its January average — a decidedly chilly 6.2˚C. Some of the cold drinks consumed during summer in Scheveningen’s cafes end up warmer than that! In a world that now embraces sunshine and heated pools it’s easy to overlook how attractive immersions in the invigorating water of the North Sea was to bathers during the early years of this spa town’s evolution, from 1818 onwards. Some doctors recommended it as beneficial to their patient’s health in the early years of the 19th century. Taking a dip in the sea is still one of the joys of visiting Scheveningen. Strolling to the waterline, with golden sand scrunching under your bare feet, takes some time. The beach feels even broader than it looks when you’re walking across it. A dune landscape painted by Piet Mondrian. If you’re interested in how Scheveningen looked back in the 19th century head to the Panorama Mesdag in The Hague. It’s named after Hendrik Willem Mesdag, the principal artist behind the painting. Mesdag was a member of The Hague School, a group of landscape artists known for their realistic paintings and sombre palette. The vast artwork stands at the location where it was unveiled. Bearing in mind the dimensions of the immersive painting — it has a circumference of 120 metres and stands over 14 metres tall — there are, realistically, few other places capable of easily housing the 360-degree artwork, which counts as Europe’s biggest cylindrical oil painting. It depicts Scheveningen as it was in 1880, with fishing boats beached on the golden sand. Cleverly, visitors view the painting from a pavilion surrounded by sand, creating the impression of viewing a beach from the top of a dune. A windmill and landscape painted by Mondrian. There are plenty of those around Scheveningen. Tufts of vegetation sprout from the dunes that rise above the beach. Tarmac cycle paths cut through the dunes, which are criss-crossed by trails used by walkers and horse riders. The dunes north-east of Scheveningen fall within the Meijendel Nature Reserve, which extends as far as Katwijk aan Zee, another popular seaside resort. Deer and foxes count among the wildlife that roams the reserve. In excess of 250 bird species have been spotted in at Meijendel, including common redstarts and willow warblers, whose song resonates above the crashing of waves and bluster of the wind. The Strandweg runs along the beachfront to the harbour which acts as the divider between Scheveningen’s northern and southern beaches. The former is by far the most popular of the two. The more southerly of the beaches is a good tip for a quiet autumn walk. The colourful hulls of fishing boats reflect in the placid water of the harbour. Catch by Simonis (Dr Lelykade 43) is a smart seafood restaurant in an eye-catching contemporary building overlooking the marina. The restaurant sources fish direct from the local auction. 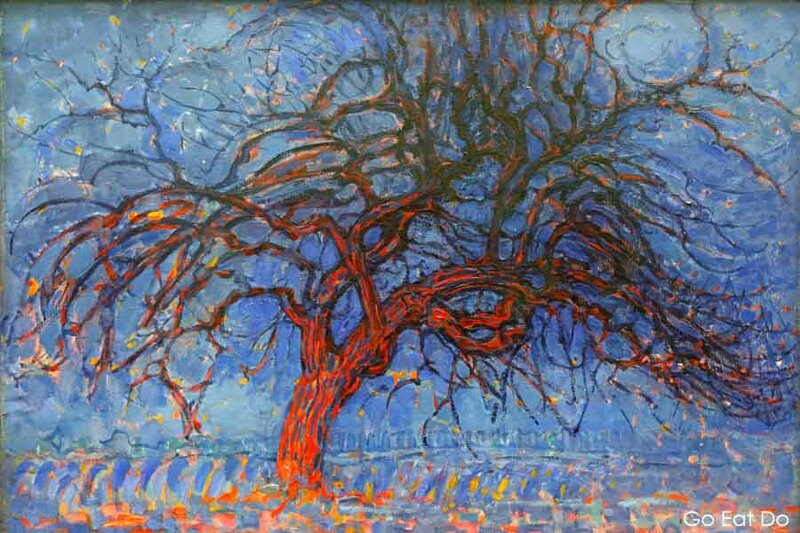 A tree painted by Piet Mondrian. If you read the word Scheveningen and wondered how the seaside town’s name is pronounced you certainly wouldn’t be the first person to face difficulties in speaking it. According to stories still told today, the word ‘Scheveningen’ was used as a password by members of the Dutch Resistance during World War Two. The reason? Most of the occupying Germans pronounced the word markedly differently from Dutch people, so, according to the legend, it quickly identified whether a person was a friend or foe. These days, as a visitor to the Netherlands, you’ll be forgiven if you mispronounce Scheveningen when ordering a taxi or buying a tram ticket to get to the resort. There’s plenty to do on a day out. To understand more about marine life step inside the popular Sea Life Scheveningen and view the aquariums. Nestled among the dunes is the Museum Beelden an Zee where sculptures are displayed. Close by you’ll see figures crafted by Tom Otterness, an American sculptor, in the free-to-visit sculpture garden. If waves are lapping the shoreline you could even head along to the Hartbeach surf shop and ride them — lessons are available. For outstanding views over Scheveningen, take a ride on the Ferris wheel that rotates on the pier. Recently renovated, the pier also features a 55-metre tall tower from which you can zip line 350 metres back to land at speeds of up to 80 kilometres an hour. That takes you towards the Grand Hotel Amrath Kurhaus, the five-star property that opened in the late 19th century and recently underwent a major restoration to open a spa. Several members of royal families have spent time at the hotel, whose cavernous domed hall evokes the grandeur of bygone times. The terrace of Waves at the Kurhaus, the hotel’s restaurant and bar, is a refined place to watch the sunset while enjoying a bite to eat or a refreshing drink. Whether you’re into fine-dining or nibbling from a cone of sauce-topped friets — the Dutch take on French fries — you’ll be able to find food to suit your taste in Scheveningen. With activities aplenty, refuelling is one of the many pleasures of a trip to this seaside resort. A woman admires a painting by Piet Mondrian. I booked a flight from Newcastle International Airport to Amsterdam Airport Schiphol for a short break in the Netherlands. Intercity trains reach The Hague from Schiphol in under 30 minutes. Trams connect The Hague and Scheveningen. The Hague Marriott Hotel (Johan de Wittlaan 30; tel. +31 (0)70 3525 385) proved a good base as it was within walking distance of the city’s Gemeentemuseum, an art museum with the world’s most extensive collection of works by Piet Mondrian, and public transport routes. The photos illustrating this post are paintings by Mondrian, displayed at the Gemeentemuseum to commemorate a century since the beginning of the De Stijl art and design movement in 1917. Holland’s tourism information website has information about things to do and see across the Netherlands.